MOSCOW, September 1. /TASS/. Russia’s State Space Corporation, Roscosmos, has postponed the launch of the Proton-M carrier rocket with the American satellite EchoStar-21 from October 10 to November 23, as well as postponed the launch of the Russian earth remote sensing satellite Kanopus-V-IK from October till December 22, the corporation’s press service reported on Thursday. "The Roscosmos commission has drawn up a plan of launches of spacecraft within the framework of the Federal Space Program, Federal Target Programs, international cooperation programs and commercial projects in September-December 2016. The launch of the Proton-M carrier rocket with the EchoStar-21 spacecraft is scheduled for November 23," the press service said. Also, according to the launch schedule, the launch of the Soyuz-FG carrier rocket with the Soyuz MS-02 manned spacecraft, which will take a new crew to the International Space Station (ISS), is planned for September 23 from the Baikonur spaceport (Kazakhstan). On October 20, it is planned to launch from Baikonur the Soyuz-U carrier rocket with the cargo ship Progress MS-04, as of November 16 - the Soyuz-FG rocket with the Soyuz MS-03 manned spacecraft and the next ISS crew. Initially, the launch of Proton with the EchoStar-21 satellite had been planned in the first quarter of 2016, then it was scheduled in late June, and after that postponed till August 29, and later - till October 10. The EchoStar-21 spacecraft (formerly known as EchoStar T2 and TerreStar 2), manufactured by Space Systems/Loral, is intended to provide telecommunications services in Europe. 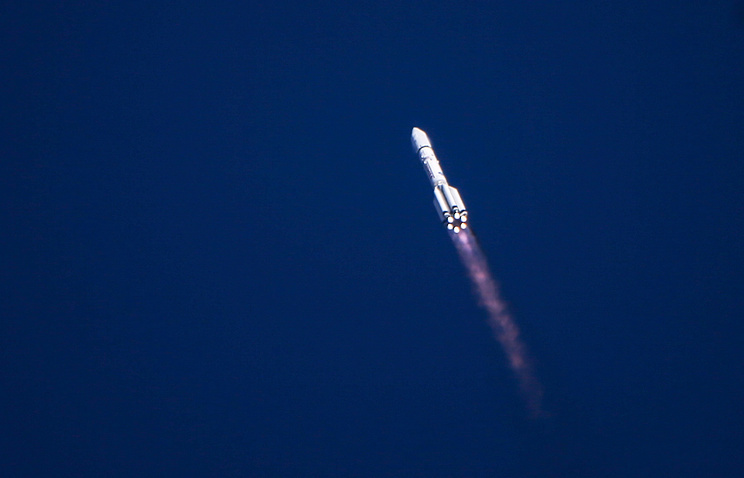 The previous launch of the Proton rocket was held the morning of June 9 - the rocket placed into orbit the Intelsat 31 satellit. EchoStar 21 is an S-band satellite designed to provide mobile satellite services to the European Union. The satellite has a service life of 15 years and carry a state-of-the-art MSS payload featuring a large unfurlable reflector. The Kanopus-V-IK satellite is planned to be placed into orbit by the Soyuz-2.1a carrier rocket that will be blasted off from Baikonur Cosmodrome. Previously, CEO of VNIIEM (the company developer of the spacecraft) Leonid Makridenko reported that the launch of the Kanopus-V-IK satellite was scheduled for October. The first Kanopus satellite was launched in July 2012. Designated Kanopus V-1, the satellite had a launch mass of 475 kilograms and was based on the Kanopus satellite platform, designed specifically for the program. The satellite hosts a panchromatic imaging system that can deliver imagery at a 2.5-meter ground resolution across a 20-kilometer swath. A Multispectral Imaging System delivers full-color and near-infrared imagery, achieving a ground resolution of 12 meters. A third instrument, a Multispectral Scanner Unit delivers data for an assessment of land and sea ice cover at a resolution of 25 meters. The BKA satellite launched for Belarus was an almost exact copy of Kanopus V-1. The second Kanopus V satellite has been modified with an added infrared imaging payload. The Kanopus V satellites are being used for mapping, disaster monitoring, detection of forest fires, studying space-based methods for earthquake prediction, land resources and agricultural activity monitoring and operational applications. A total of six Kanopus satellites are expected to be launched until 2020.